I had posted the following in the first part of the ‘blog’ (comment section) and someone was kind enough to suggest that it might be easier to find posted as a new segment/addition. Now that I have been educated, I will post the upcoming tools discussion as Part 3 and the step-by-step as future segments. For NON-functional spoons the choice in wood is completely open, although there ARE considerations. If you plan to carve in great detail, then you will want to select a wood that is tight grained and somewhat easy to carve. Straight grained wood is generally easier to carve than wood from burls, crotches and the such. The level of your carving ability/experience might also play a role in choosing a suitable wood. If you are just starting out with wood carving then I would suggest that you choose a reasonably easy wood to carve. Cherry, basswood, mahogany, sycamore, ash, beech, boxwood, horse chestnut (I find this carves easily and with good detail), witch hazel (very tight grained and finishes beautifully), black locust burl (believe it or not) carves like butter to me and the finish is pure silk. Some of the fruit wood is nice to carve… others seem to be more cantankerous. As mentioned, cherry is good, plum finishes nice without too much effort and pear wood is a pleasure to work with. Then you get to the citrus woods and I find them to be very hard and somewhat troublesome. Grape is pretty tough as well. If your carving skills are up to it, and you have a notion to try something new…. I highly recommend trying a wood that might not generally be thought of for wood projects due to size and availability. One of the really great things about spoon carving is that the size is small and lends itself to using those ‘rare’ and unusual woods. With the size being small, even the purchase of exotic wood is usually not prohibitive. The spoon size allows you to walk out back of the house and prune the lilac, or smoke tree, or redbud, or taxus, or viburnum, etc. Really almost any tree or shrub can be used. There have been spoons carved from Poison Ivy (non-functional). I just find it very rewarding to cut into an unfamiliar wood and discover a unique grain or color. Very worthwhile! Of course, a thing to remember is how intricate your planned carving is going to be, but with a ‘new’ wood you might just be compelled by the wood to take a new direction midstream. And that is highly recommended. For FUNctional spoons the choices are still quite numerous but are somewhat dependent on the intended function. A coffee scoop can obviously be more open grained and be less straight grained than what would be practical for a stirring spoon, a spoon that will be immersed in hot liquids. The stirring spoon will require a flatter spoon bowl, a longer handle and a stronger neck than the coffee scoop. For the purpose of simplicity, I am going to address in particular the considerations of selecting wood for a stirring or cooking spoon. If anyone is making a different sort of functional spoon, we can discuss the considerations unique to your design and intended use on an individual basis. As mentioned before, a straight grained wood is more suitable for a cooking spoon. I am not saying that it has to be ‘boring’, as that is not the truth. In fact, using grain creatively in designing your spoon will really add to the uniqueness and beauty. If your spoon is going to be curved (such as a dipper), the wood can be selected with that in mind. By using a natural curve where a branch meets the trunk of a tree will strengthen the spoon since you will be avoiding a ‘short’ grain. The hardness of the wood should be such that it can withstand some pressure, weight, impact and heat. The pressure of stirring a thick stew, the weight of dipping out a potato or hunk of beef, the impact of smacking your beautiful new spoon on the side of the pot to shake off the mashed potatoes and of course, this all happens under sometimes intense heat. I like making spoons but I wouldn’t want to be one. The grain direction should be considered. Looking at the end grain you will see which direction the growth rings curve. It will strengthen the spoon to use this curve to match the upwards direction of the spoon bowl. Does size really matter? Certainly you will want to consider the planned use of the spoon to determine its size. For our stirring spoon example, 10”-12” long would be a reasonable size and maybe a couple of inches wide. There is obviously some flex here, depending on personal preference. I have big hands and those skinny little handles on the store bought spoons just want to spin, making them hard to grasp. Well, that leads us to shape. We’re talking about basically three parts to the spoon. The bowl, the neck and the handle. A stirring spoon bowl would be flatter than a dipping spoon, but a well designed spoon could be used for both. 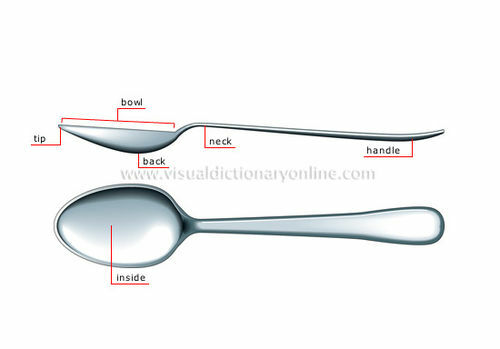 The neck of the spoon should not be spindly as this is where most of the pressure will be applied to the spoon. Making the neck thick and strong enough can be an integral part of a gracefully designed spoon. Balance is the key. As mentioned, a skinny round handle can be difficult to hold onto. I would suggest a flatter, more oval shape to the handle, regardless of how it is to be carved or decorated. The flatness could be on either plane and it doesn’t have to be uniform…. Just comfortable to hold. One way to get the perfectly shaped handle is to shape modeling clay by squeezing it in your hand like you would a spoon handle. Then use this ‘grip’ shape when carving the wood. Woods with strong smells like cedar and juniper might not be the best choices. And there are some woods that tend to irritate the skin so choose something NON-toxic. I am going ‘out on a limb’ here and suggest that a green wood can be used as effectively as the dried wood. I say this with reservations though. I have found that many of the green woods I carve are pretty much dried by the time I finish. This could just mean that I am a slow carver, but if the wood is not thick, and the grain is fairly straight, it always seems to work itself out. There is probably some ‘movement’ after I am finished with the spoon but I have only seen it on two occasions. One was oak burl and one was macadamia wood. I will say more about the green wood later when I address the tools needed. Point is, green wood can be easier to carve, especially with chisels (tends to clog the rotary tools). Overall, when you add functionality to the project you are also adding considerations on wood selection. But rather than being an ‘either/or’ choice, it can be a ‘both/and’ creative project. Just be certain that the decorative aspects of the spoon don’t interfere with or complicate the functionality. A case in point would be to have intricate carvings near the bowl making it difficult to keep clean. I will be adding to this as we go along since some of the topics cross over when we are talking about tool selection (coming up! ), but if anyone has any questions at all, either generic or specific, please don’t hesitate. and for the diagram … somehow, this “plain old spoon” helps with the creativity. I guess it is the same old wisdom: you have to know the rules before you can break the rules (and make it work). We’re off and running! Part two was chock full of great information. Thank you for your wonderful attention to detail. I’ll never look at a wooden spoon the same way again. Looking forward to part three. I couldn’t wait! I made a coffee scoop and got carried away making the bowl. I have a coffee scoop with a slight hole just under the handle that appeared during the sanding process. Sounds like a lesson learned. I am going to try some crepe myrtle (a common flowering bush here in the southeast) that I think will make a neat little spoon. I can hardly stand it waiting for your next lesson! -- Jim, Richmond Virginia - Plan your work - Work your plan. Your case would be different, but if you have a lot of work into it already, I bet you there is a way to save it. You know more about spoons than I thought possible. I love hearing someone discuss a passion. At the campsite on a canoe trip—green birch, beaver wood (usually dried and peeled aspen), yellow and white birch heartwood dry (tough as hell with all but sharpest knives/gouges but shines when burnished with a brown paper bag). If it goes in your mouth try walnut oil. If not, BLO+thinner+poly, enough to get a film layer then polish with beeswax in turps with 5% or less carnuba. No dishwasher—ever.